The United States (US)–Mexico border is one of few places in the world where a developed country has a common border with a developing country. The US economy is 25 times larger than Mexico’s and US income per capita is nearly 10 times that of Mexico, according to the World Bank. The markets for recyclable materials in both countries differ markedly. In the US, the supply of recyclables usually exceeds domestic demand, while it is the opposite in Mexico. While the US has thousands of local recycling programs, Mexico has few. Mexican industry shows a strong demand for recyclables due to significant differences in prices for virgin and secondary materials. For example, the Mexican paper industry can import market pulp (wood pulp used to make paper purchased at market prices) from the US or Canada, or, alternatively it can consume domestically recovered or imported wastepaper. Imported market pulp is seven times more expensive than domestic wastepaper. In Mexico, however, because there are few recycling programs, demand for recyclable materials usually exceeds supply. This has stimulated an active international trade of recyclable materials between the countries. The US is the world’s largest source of recyclable materials and the largest exporter. The North American Free Trade Agreement eliminated most tariffs on recyclables, which increased US exports to Mexico from 700,000 tonnes in 1993 to 1.6 million tonnes in 2005. Exports have diminished from that peak in 2005, but they could rebound with economic recovery. Recovery of recyclables in Mexico depends largely on the efforts of thousands of scavengers who collect recyclables from the streets, containers placed curbside for collection, dumpsters, transfer stations, open dumps, composting plants, and from landfills. 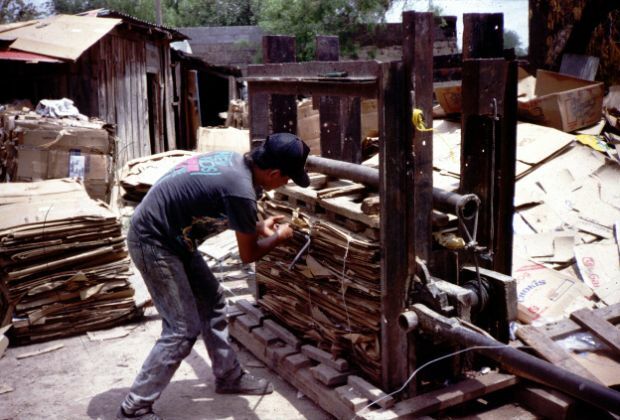 A makeshift cardboard baler used by a scavenger co-op in Nuevo Laredo, Mexico. Photo: Martin Medina. Income affects the waste generation rate and composition of the waste stream. Upper and middle-income individuals tend to generate more waste than their low-income counterparts. And the waste they generate tends to contain a greater percentage of recyclables, such as metals, glass, paper, and plastics. For Mexican scavengers living on the US–Mexico border, the garbage generated in US border towns is richer than any in Mexico. Many of the materials and items discarded by US residents and businesses are valuable and considered a resource across the border in Mexico. So, Mexican scavengers can achieve relatively high incomes by recovering waste materials in the US. However, access to this “rich” garbage is restricted, and not everyone can gather recyclables in US border towns because Mexicans wishing to cross the border need a US visa, which is very hard to get for low-income individuals. Scavenging for self-consumption — In this type of activity, individuals salvage items from the waste stream to satisfy their own needs. They recover food with expired consume-by dates, but still in edible condition, from US shopping centres and grocery stores. They also roam US residential neighbourhoods, looking for discarded furniture, appliances, clothing or any other item that can be reused or repaired. Some Mexicans cross the border into the US to gather construction and demolition debris from construction sites, as well as from homes being remodeled. They salvage discarded sheet rock, door frames, window frames, and even toilets, which are taken to Mexico and re-used in building their homes. Recovery of materials for sale to consumers — Since many low-income Mexican border residents lack a US visa, they cannot cross the border and they are unable to gather usable items. Some enterprising individuals recover discarded items in order to sell to people unable to cross the border. Recovery of materials for sale to industry — The most common recyclable materials gathered by Mexican scavengers in the US are cardboard and aluminum cans. Cardboard collectors are popularly known as cartoneros. Most American border towns have a commercial district near the border crossing that caters to Mexican consumers. The city of Laredo, Texas, has had over the past several years some of the highest retail per capita sale rates in the US, and Mexicans account for about 65 percent of those retail sales. Retailing generates a lot of cardboard. The discarded cardboard is clean and the cartoneros never come in contact with mixed wastes while collecting it. They simply pick it up, load it onto their vehicles, transport it across the border and sell it in Mexico for recycling. These are nearly ideal conditions for scavenging: it is relatively safe; scavengers can earn a respectable income; it involves no significant risks to the cartoneros’ health; and, they are not harassed by police or looked down upon by people. A study in the neighbouring towns of Laredo, Texas and Nuevo Laredo, Mexico found that Mexican cartoneros recover approximately 682 tonnes of cardboard every month, with an economic impact of nearly half a million US dollars a year. The typical cartonero earns the equivalent of three times the minimum wage in Nuevo Laredo (about US $15/day), which represents a higher income than that of many factory workers and employees. The average cartonero has been recovering cardboard in Laredo for 14 years and engages in it on a full-time basis. It is a stable activity that has allowed them to raise a family. Most cartoneros consider their working and living conditions as fair/good, according to interviews I conducted for my 2007 book The World’s Scavengers: Salvaging for Sustainable Consumption and Production. Mexican scavengers also recover aluminium cans in the US. 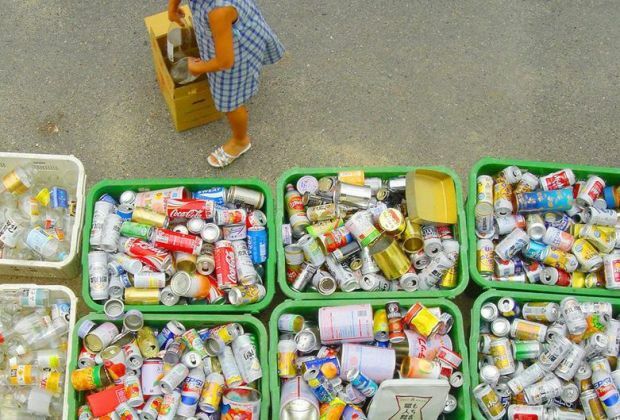 Popularly known as buscabotes (literally: can seekers), this group salvages aluminium cans from dumpsters located in public spaces, street waste containers, residential garbage placed curbside for municipal collection, or simply littered on the streets. Some buscabotes recover cans on a full-time basis, while the majority of them do so in their spare time to earn extra cash. Collecting aluminium cans is not as lucrative as collecting cardboard. Most buscabotes must roam through several neighbourhoods on foot carrying a sack or plastic bag containing the cans. They spend a considerable amount of time walking in their search for cans, which lowers their productivity, and ultimately, their earnings. The Mexican buscabotes operating full-time in Laredo, Texas, for instance, earn the equivalent of only 64 percent of the Mexican minimum wage. However, not all recovery activities carried out by Mexican scavengers in the US are beneficial to American communities. Sometimes Mexican scavengers steal aluminium cans from recycling bins placed curbside. They simply extract the cans before municipal collection. This theft of aluminium cans diminishes the revenue for municipal recycling programs. As a result of persistent theft of recyclables, 220 cities and 33 counties in California have recycling programs with anti-scavenging provisions. Individuals stealing recyclables in these communities could be prosecuted and incarcerated. In addition to scavenging, there are also established businesses that purchase reusable items and recyclable materials in the US and sell them to Mexicans. Some businesses operate on the US side of the border but cater to Mexican shoppers. Low-income Mexicans constitute important customers for thrift and second-hand stores located on the border. Poor individuals purchase used furniture, appliances, clothes and kitchen utensils in US stores and then take them across the border. Most US border towns have stores that specialize in selling discarded clothing in bulk to mostly Mexican customers. Any unsold clothing is purchased by Mexican companies to make industrial cleaning rags. On the other side of the border, many stores in Mexican border towns sell second-hand US consumer products, such as refrigerators, stoves, washing machines and dryers. These appliances often have to cleaned, refurbished or repaired before selling them. Some Mexican businesses obtain discarded items in the US and sell them in Mexico as construction materials. Entrepreneurs purchase from US construction and demolition companies, particularly in California and Texas, discarded items such as old door frames, window frames, wood/vinyl panels, sheet rock, toilets and bathroom fixtures to be sold in Mexico. Discarded wooden pallets and plywood are also used in Mexico as construction materials to build shanties. In many cases, homes in California and Texas are dismantled, their components taken across the border and reassembled in Mexico. Over the past few years, the recovery of discarded garage doors in California has become very popular. The doors are taken to Mexico, where they serve as walls and roofs for low-income housing. Crossborder business-to-business transactions in recyclables also exist. Scrap dealers in Texas purchase waste materials from the assembly plants (maquiladoras) located in Mexican border towns. The assembly plants sell iron and steel scrap to the dealers, who in turn sell it to steel mills in Mexico for recycling. The dealers also purchase old metal parts from the factories in Mexico, take them across the border to their warehouses in the US and sell them back to Mexican companies as spare parts. In conclusion, the economic disparity between Mexico and the US has created very different markets for recyclables in each country. Mexico has a steady and strong demand for recyclables from the US, which has stimulated international trade in scrap. The availability of high-quality reusable and recyclable materials in the US as well as Mexican demand have also resulted in a complex system of informal crossborder recovery involving scavengers and businesses. We know very little about the economic impact of this informal crossborder flow of recyclables, but it is likely to be several million dollars a year, and benefit many thousands of Mexicans. What we do know is that it is mutually beneficial: it satisfies a need in Mexico, provides income opportunities to Mexicans and some Americans, and reduces the amount of waste that needs final disposal, thus saving in disposal costs, and extending the life of landfills. These crossborder activities benefit both countries and should be actively supported. Such crossborder activities also exist in other border areas, such as Mexico–Guatemala, Colombia–Brazil, and China–North Korea. Individuals from the poorer country cross, sometimes illegally, into the more prosperous cities in the neighbouring country in order to recover recyclable and reusable items. A more active trade in second-hand products between developed countries, such as Japan and its neighbouring developing nations, could be mutually beneficial. But attention should be paid so that this is not used as an excuse to ship unusable items to developing countries. Recycling on the US–Mexico Border by Martin Medina is licensed under a Creative Commons Attribution-NonCommercial-ShareAlike 3.0 Unported License. I wonder how the following stat was calculated: “most tariffs on recyclables, which increased US exports to Mexico from 700,000 tonnes in 1993 to 1.6 million tonnes in 2005.” Any ideas, anyone? As a gringo living just south of the border I would love to see Mexico rise to the occastion of putting their reclyable materials into true recreated products…it could be done…they need the correct machines and engineering to do so…Tijuana is a plastic manufacturing city….there are gaps …..at this point they are bundling their recycables and shipping it to China which is a waste of transport. Keep it here for jobs and product…..an example is recycled pet bottles that can be turned into highly demanded cushion material…..start making it in Mexico…..common sense? Thanks Susan, your comments on this year-old article are very timely. Martin Medina has an upcoming follow-up article on PET recycling in Mexico, which will touch on some of your points. Stay tuned. looking forward to it. I am in the process of creating a bridge from the XPAT community to the recycling efforts here locally. The gringos want very much to recycle but just don’t know where to begin. But now ECOCE has been working with the local schools for collection and education. We have been collecting and bringing to the schools….it is a beginning. Has the Martin Medina article been published yet? Our group for now called Baja Natural Amor is starting to put dots together, beach cleanups,collection centers, etc. and I am gathering as much info as I can put my hands on. We will need to come under an NGO or form our own to go forward with funding to facilitate our work. Please drop us a note via Contact Us (in the More drop down at top right of the site) with your e-mail address and I can put you in touch with Martin, if you wish. Mr. Medina – I am a MBA student at Emory University working with 7 other MBA students in collaboration with Kimberly Clark’s Latin American Operations working on a feasibility project to develop a recycling program for Bolivia.